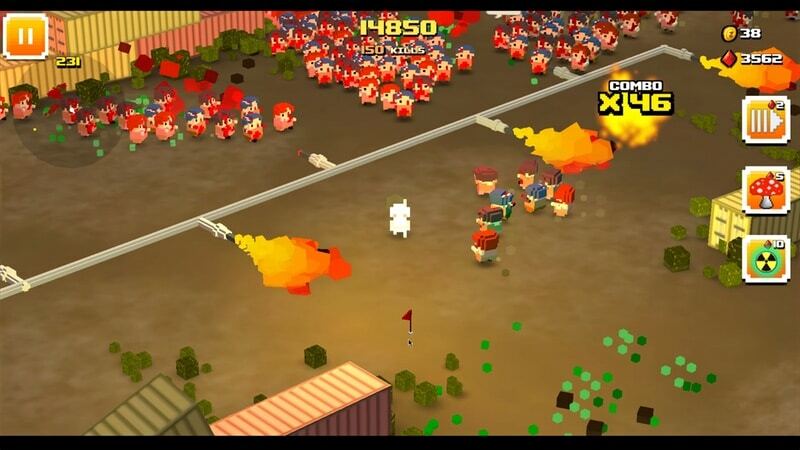 Indian game developer Roosh Interactive has merged the zombie survival genre with endless running games to create Zombie Bloxx. 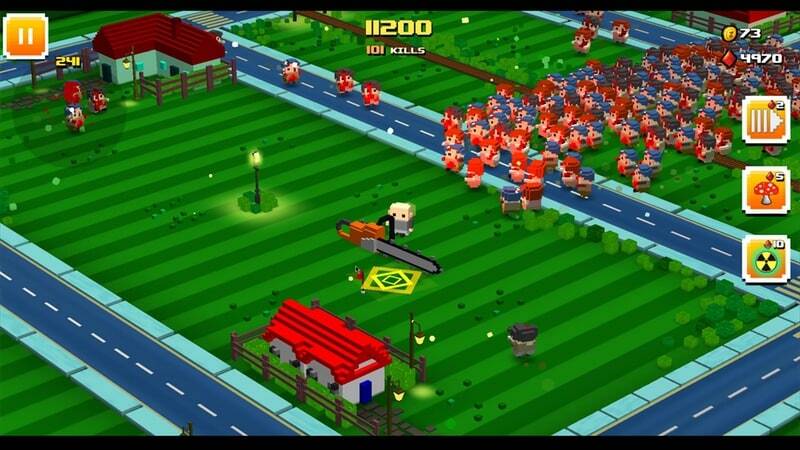 The game’s art style is similar to that of Crossy Road, which is clearly a big influence here. You can see that in the way the gameplay differs from character to character, and in each of its many fun locations where zombie hordes are chasing you. The fun thing about Zombie Bloxx is that you get to destroy zombies in a creative way. You can do this by making use of periodic weapon drops or by luring them into traps built into every one of the game’s locations. Be it massive dinosaurs or giant flamethrowers, you can use the environment to help you survive for longer in this game. Similar to endless runners, your character ultimately ends up dying but don’t let that worry you — the character’s body explodes when that happens, so you never actually turn into a zombie. Each level begins with a few zombies chasing your character and you tap (or click) around the screen to move. The zombies are not slow and shambling either – they have no trouble keeping up with you so you have to stay on your toes. Once you tap in any place, your character will keep moving in that direction unless you change it. The game’s levels are quite big, but they aren’t endless. Think of each level like a large area with walls — there’s a lot to explore and a lot of ways to kill zombies, but at some point you’re going to be cornered because the number of zombies keeps increasing. The levels don’t have names, or at least the game doesn’t display the names, but there’s one that looks like a war zone in the desert with tanks around to crush you or zombies, and flaming weapons aplenty. There’s an airport hangar, a neat city, and our favourite — a prehistoric level with giant dinosaurs, treacherous plants, and lava to help you defeat zombies. This is complicated by zombie bosses who start appearing and some of these take multiple hits to kill. A simple obstacle in a park might kill you or small zombies, but not some of the bigger bosses. Zombies aren’t the only thing you need to worry about either. Each character has a stamina bar and when this runs out, the character collapses and dies. An energy powerup refills the stamina bar, but it can get tricky to pick these up when zombies have surrounded you. Some characters survive for 45 seconds without a powerup, while some others can go for 90 seconds without an energy powerup. Each character has its own unique weapon and you’ll just have to keep playing to find out which one you like best. Some of you might want to plough through with a shotgun, while others might prefer having a bunch of rats kill all zombies around you. You can unlock some characters by spending in-game coins, while others will need gems. You can earn both of these by playing the game, but there are certain “epic” characters that cost 500 gems each, such as the hilariously named Mr. Drumpf (his tagline is: “a few call him POTUS”), and if you want to unlock these in any reasonable time frame, you might have to end up spending. We played Zombie Bloxx on an iPhone and didn’t find the free-to-play monetisation elements too annoying. You can watch an unskippable 30-second video ad to revive your character after it dies, and if it dies again, you can revive it using gems. You also need gems to unleash monster weapons such as a nuclear bomb (10 gems) to get rid of zombies, which means that some of the coolest features come at a high price. Earning coins or gems isn’t terribly difficult but it feels like the game is nudging you towards paying, though thankfully the push is subtle. We really enjoyed playing Zombie Bloxx because of its variety of levels, characters, and fun pick-up-and-play style. The developers have found a good balance between trying to make money and making an addictive game and we’re happy to recommend it to everyone. Zombie Bloxx is a premium game on Windows, so if the free-to-play monetisation bothers you on mobile, feel free to pick it up on Steam.